Leon Fleisher, the American-born pianist whose remarkable return to two-handed performance created one of the most successful recital recordings of this decade, returns with another recording of solo piano music. Fleisher performs works that helped launch his career, as well as those that he was expecting to record before he became afflicted with dystonia, and some that he has recorded "simply for the challenge of recording a great piece of music". Bach�s Capriccio on the Departure of a Brother begins the recording. One of the only programmatic instrumental works by Bach, this charming work was a traditional opening work favored by Fleisher in the late 1950s, although he prefers to remember the work as performed by Rudolf Serkin at a Carnegie Hall recital in the early 1960s. Mozart�s Sonata K292 holds an esteemed position in Fleisher�s career and in his memory. It was his performance of this work in 1952 that won him the first prize at the prestigious Queen Elisabeth Piano Competition. Stravinsky�s Serenade is a very rarely recorded work, but it was a staple of Fleisher�s repertoire in the 1950s. Stravinsky�s son worked with Fleisher to help correct mistakes in the original printed score. The one work that looks to the future is the tortuous Chromatic Fantasy and Fugue by J.S. Bach. Or, as Fleisher refers to it, the �Traumatic Fantasy and Fugue�. "It�s such a great piece, I just had to get it down before it got too late," Fleisher said. "I haven�t performed it much but I do plan on including it in a few recitals down the road". Two other shorter works are included on The Journey - Chopin�s Berceuse and Beethoven�s famous F�r Elise. "It�s those familiar pieces that can really trip you up�everyone knows them, so you have to be right on top of it, or else everyone knows something�s not right". 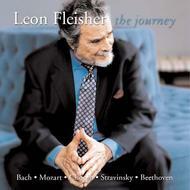 The package Vanguard Classics has created for The Journey includes a special exclusive disc Tracing The Journey, featuring an interview with Leon Fleisher performing musical excerpts from The Journey as well as explaining Bach�s Capriccio on the Departure of a Brother, the key role in his career Mozart�s Sonata K282 holds, the history of works for the left hand only and the real challenge of performing at Carnegie Hall ("it�s a big stage�make sure you get to the door before the applause dies down").